Welcome to my blog. I am excited to announce that my latest book and first work of fiction, SHOW ME YOUR FACE, is now available on Amazon! I started this blog with the idea of sharing information about backpacking and camping with kids, and let’s be honest, selling my books, Camping With Kids (Wilderness Press) and Backpacking With Babies and Small Children (Wilderness Press, newly rescued from being out-of-print by the Authors Guild Back In Print program with iUniverse). Then I realized that I lead a very interesting life. There is so much more to Goldie Gendler Silverman than those two books. So I will report on my Wednesday Walkie-Talkie hiking group, and my writers groups (the weekly critique group and the monthly meetings of Seattle Free Lances), and my work with victims of domestic violence and with the homeless, and on my interesting travels, and my fantastic family, and anything else that strikes the fancy of an elderly Jewish grandmother who would rather find herself on the side of a mountain than almost any other place on earth. And one more thing–there will be something to learn in every single post! Goldie Gendler Silverman grew up in Nebraska and learned to camp in Washington, Oregon, California, Idaho, and Arizona. 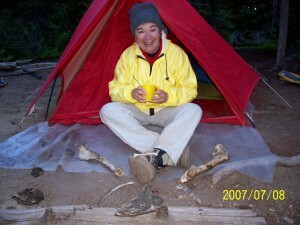 After several years of teaching English at the high school and university levels, she began writing remedial reading textbooks, co-authored four cookbooks, and then went on to write Backpacking with Babies and Small Children, published first by Signpost Books and later by Wilderness Press, and now by iUniverse, and Camping With Kids, also published by Wilderness Press. Mother of three grown children, two almost-grown grandchildren, and two rapidly-growing greatly adorable grandchildren, Goldie now hikes all over the world, but still hikes and backpacks with her family near her home in Seattle. I love your books, and I am so glad I looked you up online. Great blog! I am reading Camping with Kids with the aim of telling readers about is on RoadTripsforFamilies.com. I am looking for a speaker on the Elwha restoration for the Rotary Club of Seattle with 700 members. It was great meeting you the other night….could you please e mail with your e mail…I have a question to ask you. I found your cookbook in a thrift store this spring, and bought it for my boyfriend. He lost his house in the May 2013 tornado in Moore, Oklahoma. The book was old, and comb bound. It had a receipe for a salt substitute, using herbs and powders. I’ve been looking for another copy (comb bound) but can’t find it. Is it possible to find that salt seasoning for cooking somewhere else?? ?